456 Keppochhill Road, Glasgow. G21 1HY. Other names this old pub, The Auld Hoose, Rockerfellow's. In 1873 Cowcaddens wine & spirit merchant John Caldwell was licensee for a new pub on this site. Mr Caldwell ran a small pub on Milton Street before taking on this new public house. John was born in Houston, Renfrew, he met Mary from Dollar and were married. Their six children were all born in Dollar, John started in the licensed trade as a wine & spirit merchant in 1862 at premises 37 Milton Street, Cowcaddens. 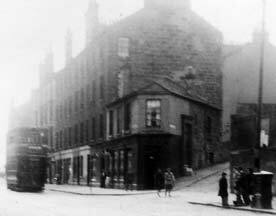 The Auld Hoose sitting at the corner od Scone Street. Circa 1930s. John was living not far from this pub but soon moved to better accommodation with his family to Kilmalcolm House, Scotia Street and then on to Tandle Hill, Kilmalcolm. Mr Caldwell became very successful in the licensed trade opening other premises the Milestone Bar on Garscube Road, he also had the advantage of owning the property of all his pubs. In 1899 the Milton Street premises were sold on to publican John Baxter, his other two properties on Garscube Road and Keppochhill Road were taken over by Thomas Wilson. Thomas like Mr Caldwell ran a successful business here for over thirty years. Thomas was born in Killearn, Stirlingshire, he came to Glasgow where his father started business in the Cowcaddens, he obtained his first rudimentary training in the licensed trade. Thomas then went on to work with James Anderson, publican in Parliamentary Road, a few years later he was appointed charge hand in John Caldwell's, 37 Milton Street. In his capacity he remained for the long period of fifteen years, when as a fitting and well-merited reward for his faithful services he was assumed a partner, an arrangement that lasted for another fifteen years. The old pub on Garscube Road was demolished and a new four storey building with a new pub on the ground floor was erected in 1909 by his son architect James Wilson. The pub was again sold to the Grant family in 1930, William Grant was licensee for over twenty years, his wife Alice then continued in the pub from 1952. The family ran this pub until the 1980s. The pub was named Sweeney Todd's after the owner Margaret Sweeney. The pub was demolished a few years ago.